Rob Cesternino and Akiva Wienerkur don’t actually love the Drake, but they do love bringing you their expert insight on all the Seinfeld episodes each week. 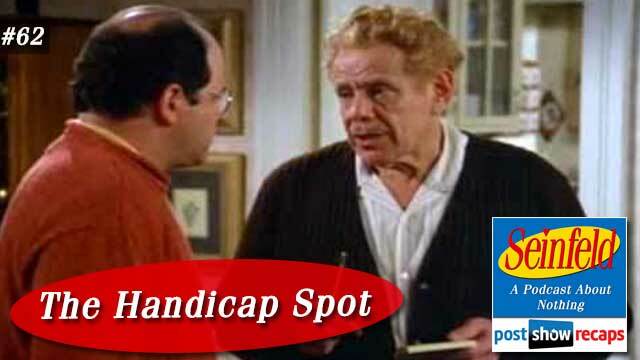 This time they discuss “The Handicap Spot”, which first aired May 13, 1993 as part of season four. Before the news, Rob mentioned how this episode had the first appearance of Frank Costanza, though on some outlets, it has the first actor hired for the part rather than Jerry Stiller. Akiva’s news centered around the closing of Larry David’s hit Broadway play A Fish in the Dark. Larry mentioned in an article how there is no chance he will go back on stage to reprise the role. Rob’s Seinfeld Scene It trivia question was one from an episode not yet covered, and Akiva missed another one, dropping his record to 3-3. Jerry’s opening standup was a bit about how being single makes you like a dictator of your life. The episode opens at Jerry’s apartment with George asking Elaine why attractive women walk so fast. She responds that “we” don’t always walk fast. When Jerry comes in, Elaine asks to go along to The Drake’s engagement party, while Jerry is trying to impress her with his perfectly drawn triangle. George takes the opportunity to complain about having to buy a present for every little event. When Kramer comes in, he gives Jerry his due on the triangle, even saying he would name his child Isosceles. They all end up agreeing to chip in for The Drake’s gift. In order to all get out to the engagement party in one car, they need to borrow George’s dad’s car, but have to come up with a complicated plan to still secure Frank’s premium parking spot he currently has. When they get to the mall with Frank’s car, there are no spots, so Kramer suggests they just park it in the handicapped spot. Jerry and Elaine protest, but George gets talked into it. Rob suggested that such a move would be even more frowned upon today than in 1993. After buying a big screen TV for The Drake, they head back to the car only to discover that a handicapped person got hurt trying to get their wheelchair up a steep incline, having to park way out in regular parking. A mob has formed around Frank’s car, waiting to get the people who illegally parked. The gang decides to go to a random coffee shop until it all blows over. When they head back to the car, the mob is gone, but Frank’s car has been battered to bits. In the next scene, George goes to his parents to tell his dad about the car, making up an elaborate story to which Frank is so mad, he doesn’t seem to care, slapping George in the head for the mistake. Back at Jerry’s, Kramer shares how he went to meet the woman in the wheelchair, and has fallen in love. He tells them they need to all chip in to buy her a new wheelchair, since it was totaled. Elaine and Jerry agreed they won’t since they objected to parking in the spot, leaving George the only one on the hook with Kramer for this. Kramer and George go to a wheelchair store to buy a new one for the woman, and learn that the top model runs $6200. George inquires about one less expensive, so they end up with a used model for much cheaper. Meanwhile, Jerry and Elaine head out to The Drake’s to visit, but when they get there, they learn The Drake and Drakette have broken up, leaving them wondering if they can get the big screen back. After getting back from The Drake’s, Elaine is upset because The Drake let his ex keep the gifts, so they don’t get it back. Jerry joins in on the vitriol, claiming he now hates The Drake. When Elaine calls The ex-Drakette, she tells her Elaine that she gave the gifts to charity. Kramer comes in and tells them he gave Lola the new/used wheelchair and she was delighted. Later on, Frank Costanza is receiving an award for raising money for a charity, but the police barge in to arrest him for his car being parked in a handicapped spot. Back at Jerry’s, George explains what happened, and shares how he will repay his dad by becoming his butler, a suggestion that Estelle Costanza’s friend recommended. Kramer comes in and informs them that Lola dumped him, calling him a hipster doofus and telling him to drop dead. This upsets George since he spent $240 for this wheelchair. The scene cuts to Lola flying backward down a hill as the used wheelchair ended up being faulty. Next, George is at his parents performing his butler duties. When Frank hears that this woman was given a faulty wheelchair, he orders George to pick up a big screen TV and deliver it to the woman. George and Kramer go in to the ex-Drakette’s place to pick it up, with Jerry and Elaine waiting in the van so they can all bring it back to return to the store instead. The final shot is them debating whether or not to park in front of a fire hydrant. Jerry’s closing standup is a bit about handicapped spots being a mirage in the parking lot. Akiva and Rob both agreed this episode is a bottom half episode, but Rob did think that “The Smelly Car” was better. Going off on a tangent when emailer Amir is brought up, the guys discuss how Amir’s brother started a “fund me” campaign to help raise awareness of the New York Mets’ need for quality hitting, also noting how emailer Chester donated $10,000 for this. Getting back to the ranking, Akiva decided that “The Handicapped Spot” deserved to slot in at 133. There were plenty of emails to go through this week. First, Travis noted that while this was a subpar episode, it was loaded with subtle callbacks throughout it. Ariel shared a video from Brazil sabotaging a car parking in a handicapped spot by putting post it notes all over it. Johnny De Silveira emailed in to share that the cars in the parking lot in the final scene all had California license plates. Also he shared that the $6200 wheelchair would be $10,200, while the used one would be $395 today according to the inflation calculator. Amir emailed in to say that you cannot be arrested for parking in a handicapped spot. Also, he learned that proper etiquette would require returning the gifts to the purchasers. Lastly, he wonders how Frank could have an insurance policy that wouldn’t cover vandalism. Chester wants to know why Jerry and Elaine would brag about how great a gift they got in front of The Drake, but Akiva and Rob felt that’s not a big deal. He also asked how Frank would be arrested when their was a cop there when the gang came back to the car, and he didn’t even leave a ticket. Akiva thought there was probably more investigating needed. Lastly, Chester wondered why so many people tell Kramer to drop dead. There weas also an email about a previous episode. Adrienne from Ireland pointed out that in “The Outing” podcast, Akiva and Rob couldn’t understand why the scene with the owner of Monk’s telling them to calm down was relevant. She solved it by pointing out the camera zooms in on him wearing an earring, as a way to indicate he was also gay. Lastly, Dominic recommended they talk about the Korean show The Genius for their season break “one off”. 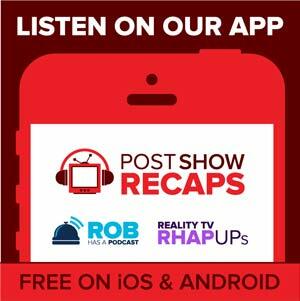 Tune in next week as the guys will recap “The Pilot”, which is one of Rob’s favorites. Send in your questions by emailing [email protected]. Don’t forget to subscribe to the podcast by going to postshowrecaps.com/seinfeldITunes where Rob and Akiva greatly encourage you to rate and review the podcast. And as always, you can follow them on Twitter @robcesternino and @keev26.